My Zaycon Foods Freezer Cooking Day! We make it a habit to buy our meat in bulk and prep all the meals at once so we always have a freezer full of homemade meals ready to go, because it saves us so much time and money! Well I have only just recently been introduced to Zaycon Foods and a whole NEW way of buying meat, and I’m amazed at how much more money it can save us! Zaycon Foods has a unique business model where they take orders for bulk packages of foods like chicken, beef, bacon or fresh seasonal fruit and they hold events around the country where you can pick up your order. 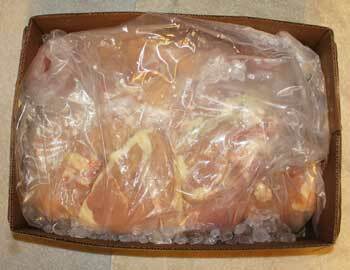 This chicken was delivered to me to try and review because Zaycon is planning an event in my area soon. Honestly, I didn’t know what to expect because this was all new to me, but I couldn’t be more satisfied with the quality of the meat, the presentation, and the customer service. They only sell 100% natural chicken with no added hormones, additives or artifical ingredients that comes directly from the farm and has never been frozen (I added the ice you see in the picture on prep day). The day this big huge box of chicken arrived I didn’t have time to do anything with it so I cleared a shelf in the frig and waited for the weekend. When Saturday rolled around hubby and I made quick work of cutting the chicken into appropriate size pieces for stir fry, fajitas and tenders then divided it into meal sized portions for our family of seven. I had a bunch of marinades already in the stockpile, but I really like to make my own fajita marinade, and one of my favorite quick meal tips is to freeze the meat with the marinade in freezer bags so the meat marinates as it thaws which keeps it nice and tender. The chicken breasts are really large so we took two of the four bags of chicken that came inside the larger sealed bag and cut them into long strips, or tenders, about three each per breast. These we divided up into meal size portions and put half in freezer bags with garlic and herb marinade, and the other half in bags with lemon pepper marinade. One of the remaining bags was cut into stir fry sized pieces and placed in freezer bags with a store bought Teriyaki sauce, and the final remaining bag was cut into fajita strips and put into bags with my fave homemade fajita sauce. 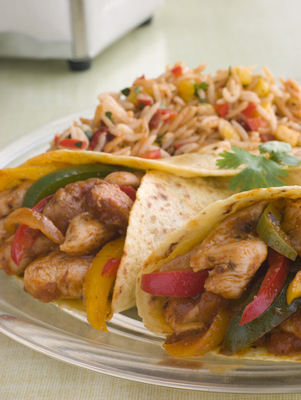 We tried the fajitas out for dinner last night and they were fabulous! My favorite part though is the math. 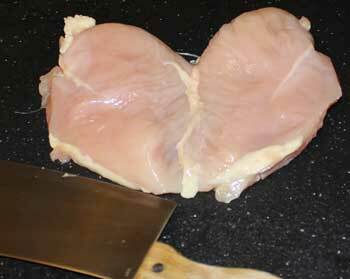 The current price for the chicken is $1.59 per pound, or about $65 for this delivery. We ended up with 23 entrees which equates to $2.83 for each meal, or about 40 cents per person! Amazing! I’m really looking forward to the next Zaycon Foods event near me, and I simply cannot wait for a beef (or bacon!) event. YUM! Sign up today for free email alerts when Zaycon will have an event near you. Disclosure – Zaycon Foods provided me with 40 pounds of fresh chicken for the purpose of facilitating this review, however all thoughts and comments are my own and I have received no other compensation for this post. That was a great way to spread the chicken around. I am going to check that out to see if it comes close to where I live. That chicken looks AWESOME — and what a great way to get a bunch of meals out of one box of chicken!! SUPER!! Yum! I’m thrilled to have a freezer full of dinners ready to go! Okay this is something I have been looking for! I love having the freezer stocked up on meats! I am a bit wary tho of this… It tastes just like any store bought chicken (weird question I know but I get weird with a change lol)? You just store them in a feezer bag? Also I need to look around more but do you have the fajita recipe on your site? I am looking for easy and quick meals (my husband still not let me know do the month meal planning). I was leary at first too, weird visions of buying cheap meat off the back of a truck, but it is FABULOUS! Very fresh, straight from the farm, just like they said it would be and they do have a full money back guarantee also 🙂 I’m trying the beef next, and can’t wait until they give me the go ahead for the giveaway! Okay registered… nothing in my area is planned.. but I will be watching for it! And I will be watching for the giveaway too heheh! !